This house stands on a small wedge-shaped site with a frontage of 5.4m and area of 88㎡. The eastern side of the site is a 20m-wide busy road, and the southern side faces a green park with a baseball field and tennis courts. Before this house was built, scenes of the park already existed: children on the playground, old people walking their dogs, or ginkgo trees that dramatically change their expression as the seasons progress. It is intended for “White Collage” to form a collage of the existing everyday scenes and the new scenes that are born from building this new house, and to create one unified scene. Since the building will continue to exist on the specific site, development of a relationship with the surrounding universal environment is important, and it is a theme that must be tackled continuously. 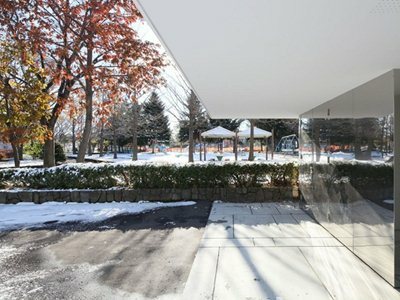 In order to capture various sceneries of the neighboring park inside the house, and to create a portion of the exterior skin for the building, 0.35mm thick stainless steel sheets are placed on the interior and exterior of the house. As time and the seasons go by, the somewhat distorted reflections of the scenery on these thin stainless steel sheets keep changing.